In the fall of this year I had the unique chance and honor to attend a talk by Tariq Ali, the renowned British-Pakistani journalist and film-maker. His talk was hosted by the Simon Fraser University in a series highlighting the revolutionary year of 1965. The main impetus was also to celebrate and raise awareness about the university that was turning fifty, having established itself in that particular groundbreaking year. When the Simon Fraser University was founded, in those years of social and political upheaval, history was considered a controversial subject. Many were reluctant or had become hesitant to adopt a grand narrative, a lens with which to interpret historical events partly due to the eroding effects of postmodernism. At the same time, some popular outlooks, such as the Marxist view, were fragmented, and later in shambles or re-boot mode after the Fall of the Communist party. But as Tariq Ali points out, we must see events in their context. The traditional Marxists had in the heydays a number of flaws and deficiencies, one of them being the exclusion of women and persons of color. Notwithstanding, Marxism was the grand narrative for quite some time, and SFU in the 70s was a refuge or breeding ground for those same Marxists. Marxism in its different hues and shades is still (or perhaps even more) relevant today in a world that is seeing its paradigms shift towards globalization, the new all-embracing and overriding single narrative. All this has occurred due to the history of capital that has, in turn, led to today's uncharted capitalism. This type of capitalism is not bound by the state anymore, but it is, on the contrary, strictly controlled and reinforced by state power. Do we really need democracy then, Ali asked the crowd of most likely different generations and hues of Marxists in attendance. The question is, of course, rhetorical, if not downright cynical. Our current elected politicians and their respective political parties are nothing but puppets whose influence and impact are limited to unimportant or generally insignificant issues; anything they decide or vote upon will not affect or haunt the rulers at the top. Ali has written extensively on Bush and Obama, and one of his main claims is that despite our mainstream perception to the contrary there is indeed rather little (or not enough) separating the two leaders from each other. Why are people not asking for better living conditions? For example, in the past, especially in Europe, there was a political and social ambiance that had unchangeable projects and a clear philosophy at its core. There seems to be a widespread amnesia now regarding these social topics but in the past people were not ashamed or afraid to ask for free public education and public housing. That we see it as normal and commonplace nowadays that education will cost us money and that many people in the world who do not have money are excluded from this privilege, hence making education an effective monopoly, that is, another form of capital control, all this is something we have come to accept without doubt or hesitation. But it does not and should not have to be this way. Another problem of the political project of globalization is the fact that these ideas and feelings of helplessness are transported and implemented into other countries changing their structure and ideology. The media is in decline and at the same time front and centre of all of this. In the past, notably during the Vietnam war, the media was functioning as a legitimate voice, and opposition was often expressed. Astonishing and shocking images of the war were shown and transmitted over television, while the first massive demonstration took place in 1965, an unprecedented event in the history of the United States. Nowadays, mass media is to a large extent controlled by those at the top who use it as a means of forming and shaping us into the citizens they envision and to transmit messages that suit them and their monetary purposes best. Through preambles and digressions, Ali would return to his topic and focus at hand, the year of 1965. This was the first time after the Civil War where the issue of race had become of central importance. In this veritable struggle for freedom, there was also repression against black leaders; Malcolm X was assassinated that same year. In fact, Ali talked to Malcolm X at Oxford, and the black leader told him that he did not think they would meet again; he strongly believed they were out to kill him. Malcolm X was not exactly sure who because he had many enemies at the time. The leaders were unhappy with his path, and most likely the tone of his messages, and they were also nervous about the reforms that the black communities were seeking. Unfortunately, these issues are still not resolved yet despite having a current president of color at the helm. There is deep racism at the core of the United States, and events like what happened at Ferguson only highlight this. Furthermore, that somebody like Donald Trump can get so much attention and coverage in the media and, what's worse, support from the population is a clear sign that something is seriously wrong with the current American consciousness. Tariq Ali then looked at wars and foreign policy. They are a great time for removing governments, he claimed. He gave the India and Pakistan war as one of the examples. This war had supposedly occurred over the city of Kashmir, but was more about the rule of dictatorship. The Pakistani knew that were going to lose this war, but went along with this suicide mission for a possible change of government and policies. Another focal point was Indonesia, which was seen as the biggest threat to the United States due to its Communist government. The CIA was in league and plotted with right-wing generals to carry a coup d'état. Within those weeks, 1.5 million people had died marking it as one the largest genocides in human history.Most of the killers showed little to no remorse as can be seen in the brilliant but shocking and devastating documentary The Act of Killing (2012). All the slayings in Indonesia left a huge political vacuum and so the radical Islamists entered. They are still quite active after the events of September 11, so echoes of history never go away. History does not repeat itself, but rather has small-scale revivals. In the past, the general consensus had been that communism and fascism are the same thing, but this is not true. Communism and fascism became prevalent particularly before the Second World War. An interesting and a conveniently overlooked fact regards Churchill who in the 1920s and 30s was himself antisemitic and supported fascist ideas. Mussolini, for instance, was seen as a good, strong and viable force to fight against the Jewish Bolsheviks. In fact, Mussollini's biography sold very well in England showing his popularity and the resonance of his ideas within the general populace. Hitler also found support among world leaders at first and was considered an effective means to fight against communists. Curchill, for instance, gave Hitler's book Mein Kampf a good review, while in his own country Hitler was perceived as a tremendous boon in 1939. But it comes as no surprise that Hitler was a difficult and unpredictable person to work with, to put it mildly. Soon enough he turned his guns versus the West itself. He took Europe first and then had his eyes on England. In fact, the French generally collaborated with Germany; contrary to popular belief, the French resistance was tiny. The controversial film Lacombe, Lucien (1974) by Louis Malle revealed some of those unpleasant aspects about French society in the years of the Occupation. One of the reasons the French did not offer much resistance was, according to Ali, because antisemitism was a great force in France during those days. And if we look at Scandinavia, only the Norwegians put up a fight against the Germans, while Denmark was taken rather quickly. Sweden, on the other hand, was never occupied and worked with the Germans although they were supposed to be seen as neutral. Goebbels was given an honorary doctorate in Lundt, an event that does squash any possible claim for neutrality in this matter. Ironically, the allies had to eventually accept help from their sworn enemies, the Russian communists. The same Russians who had been initially regarded as a security threat ended up being a strong asset against the surge of the Nazis. Shockingly, after World War II, 70% of Italy's most powerful positions and 60% of Germany's were kept by people who had a stake in those troublesome times. Many of the old nazis re-entered the field of politics through various means and parties. Is there any hope in all of this? Ali claims that there are a number of issues that show some promise. One of them is great cinema that has come as a result of those upheavals and changes. He singled out a number of film-makers, such as Godard, in particular his revolutionary and experimental film Pierrot le Fou (1965), as well as Fellini with his criticism of consumerism, and the works of Francesco Rosi. Ali claimed that the shift in culture is a herald for better things to come. Furthermore, he pointed out that the Occupy movement was the first sign of real awakening in the US and that we have to continue to make political demands or else we will be forgotten. History is constantly in motion, he said and it doesn't simply end although we are living in bad times. We still have hope. At the end of the talk, the speakers blasted that same uplifting message with a nasal voice singing The Times are A-changin' and I stumbled out of the hall tired and bewildered. I can understand your bewilderment. It doesn't surprise me that he keeps harking back to 1965, because his worldview hasn't changed a bit. His style of left-wingery, surviving over here in the Guardian newspaper and Jeremy Corbyn's new version of the UK Labour Party (if he doesn't destroy this venerable institution in the next few months) has always seemed to me essentially a teenage rebellion against Daddy (whilst still depending on Daddy for the basics of survival). It's rather shocking that unlike his surviving contemporaries he still hasn't grown up, 50 years later. Anyhow, excellent piece of reportage. I don't mean to say that he isn't right in many parts of his critique, but it's far easier to point out what's wrong than construct an alternative, especially when you are a revolutionary supported only by a minority. Thank you for your comment and insight, Vincent! However, to jump to Ali's defense, his talk was supposed to be on the events of 1965. The official title was "Critical Uprisings, Crucial Events: The Significance of 1965". Whether his worldview is the same or has changed, I am not qualified to comment upon. But I must say I feel somewhat relieved by your addendum. I believe that it is necessary to first pinpoint the "disease" and then try to work towards a cure. In the meantime, there will be trial and errors, missteps and failures. But in all of this, I believe we are facing two enemies: apathy and ignorance. The current state of the US presidential elections is demonstrating this. 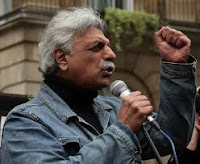 So to have somebody like Tariq Ali remind us what to aim for and what needs to be done is a definite asset.